The idea behind Share Play, the most prominent feature of Sony’s soon to arrive and feature-packed Firmware 2.0, is that it enables you to pass the controller to a friend as if you were sitting on the sofa together. Except the sofa is now the internet - if you’re friends with someone, you can play multiplayer games with them, or even let them take control of your machine as if you’d physically handed them the pad. Anyone, anywhere. This is a platform specific feature too, so publishers will have to specifically opt out. Talking to Sony, even things like alphas and betas would require the feature to be turned off. The option is accessed from the Share button menu, where there are two new choices: Give Controller to Player and Play a Game Together. In the demo the latter was used to play a two-player game of FIFA 15 across two machines connected across an internet connection (network requirements were diplomatically avoided but Sony did say it had been modelled on ‘standard broadband connections’). Seeing it in action almost seemed to be too good to be true - no lag, no noticeable issues, not even any obvious way of knowing you weren’t actually playing the game on the guest machine itself. 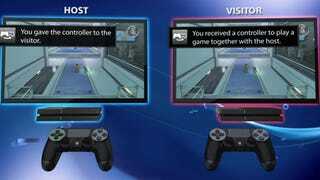 Which is where that first option, Give Controller to Player, gets interesting. While the 60 minute limit to a Share session exists, there’s nothing to stop you simply starting again as soon as it’s up. If two gamers are motivated enough they can just keep sharing. In theory you could finish a game without ever owning it. True, you’ll never earn the trophies, but Sony has effectively made games free for anyone persistent enough to play through it in chunks. But what of other possibilities? Can’t be bothered to earn a platinum? Or level up in Destiny? You could use Share Play to let someone else do it for you. It’s a cynical view obviously but you’ve only got to look at MMO farming to see that it happens. It was especially interesting to see the post-demo conversation immediately throwing around potential ways to abuse the system. If there is a way, gamers will find it. A great example would be when the PS4’s Share function first went live and people almost immediately found you could use PlayRoom to stream non-gaming content (in some cases to horrible effect). Share Play, then, is a literal game changer, but while it might be the most prominent features of the new update, it’s only one of a range of new features. You’ll be able to Share footage directly to YouTube now, for example (as long as you have a Google account). Whether that creates the same deluge of content it created for Twitch the first time round remains to be seen, but it’s arguably a more significant addition than streaming originally was. On the Twitch side of things the interface has had a revamp, with featured content and the ability to follow favourite broadcasters. Sony also showed off a new USB music player with integrated controls to let you add music via external storage to play over games. Plus there are themes on the way, with 3 or 4 planned for launch. You won’t be able to make your own this time as you could on the PS3, though, due to their dynamic nature. The home screen has also had a revamp with a 15 icon limit showing your most recently used apps. Any more than that will be automatically archived to the Library. You’ll also see friend recommendations in the What’s New section. PS4’s new Firmware 2.0 update is clearly more than an incremental step. While Xbox has traditionally made each new console upgrade a small event in its own right, Sony’s changes have been smaller and more innocuous. Until now. Whether the tactic of holding it all back will make up for a year of minimal changes remains to be seen, but it’s clear that PlayStation 4 is about to enter a new stage, and things are about to get interesting.